Around 83% of the country’s population lives in circular stick and mud structures called “tukels”. These rustic cottages generally have no windows, are tall and have thatched roofs. Florence, 60, is a widow with married children. When she was younger she was a refugee in Kenya and Uganda. Later, she studied education and Bible at a Baptist university and received a degree in agriculture and nutrition. She was a teacher and later worked for several Non- Governmental Organizations (NGOs), including the Catholic Relief Services as a nutritionist. 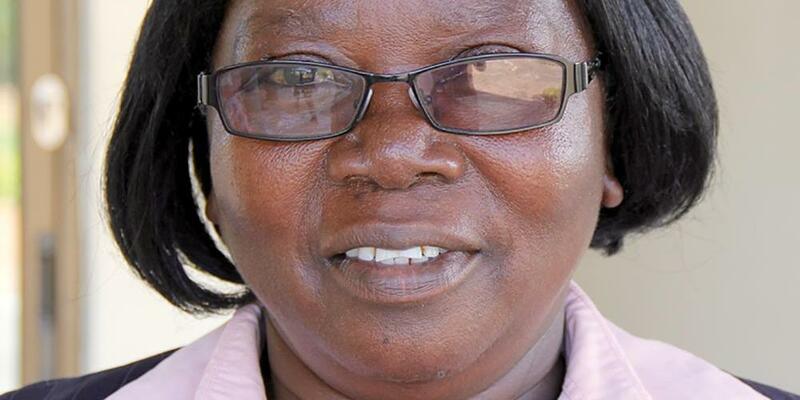 In South Sudan she taught nutrition, health education, and income-generating skills to women. She also taught community health classes and worked for Save the Children. Her last job was with the South Sudanese government as chairperson for the construction and development fund. This office closed in 2013, allowing her to find time to slow down and find God. One day Florence attended the funeral of a friend. The pastor told the mourners not to worry because the woman was in heaven looking down and feeling sorry for them. Florence went home to study what the Bible said about death. In October, 2014 she made a decision to learn the truth. She has a cousin who is an Adventist but she says, “I was always persecuting him and telling him that he and his family believed in an old-fashioned religion.” When Florence studied the Bible, however, the Lord touched her heart about where the dead are as well as the truth about the Sabbath. She called her cousin and told him that she wanted to visit his church—what time did it start? He told her they were going to be away that week and to come the next Sabbath. Not wanting to be delayed in her quest she told him she was going to the Central Adventist Church that week whether he and his family were there or not! While at the church, Florence noticed an advertisement about upcoming evangelistic meetings. She determined to attend. During the meetings, all of her questions were answered and she decided to be baptized even before the meetings were over. Florence now serves as the Women’s Ministry director of her church. Florence’s children were accustomed to the Pentecostal church where the family had been members. They asked her how she could could become so confused as to join the Adventist Church. But after studying the Bible for themselves, two of her children have also been baptized. “I’m different from what I used to be,” says Florence. “I used to be very rude. But God has calmed my heart and my friends tell me that I’m different. I tell them it’s because I have Jesus in me. The Bible is now my literature. I also like the church’s literature such as The Great Hope and The Desire of Ages. Besides her change in attitude and disposition, Florence has also experienced a tremendous change in her health. She is a diabetic and was sick and weak and would sometimes faint. Now she feels younger and her strength is returning. Florence credits this to her new knowledge about God along with a healthy diet and lifestyle. She says she used to be a coffee addict, drinking many cups at home and the office. She used to eat a lot of meat but is now a vegetarian and feels much better. For the first time in 15 years her sugar levels are under control. Florence’s doctor was surprised to see how well she was doing and wondered what had happened. Florence is quick to say that the improvement in her health comes from being an Adventist Christian, eating healthfully, and drinking plenty of water. “Now I know the truth!” she proclaims to everyone who will listen. Pastor Elia Ibrahim says that the church is blessed because of Florence’s influence.